Get your guitars off the floor and up on the wall. 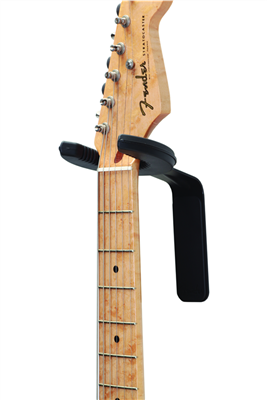 The Fender Static Halo Guitar Wall Hanger is an easily mounted wall hanger designed to display your instrument safely and securely. Its open-mouth design allows for quick access to your instrument so you can hang it or take it down in one easy move. Get your guitars off the floor and up on the wall. The Fender Static Halo Guitar Wall Hanger is an easily mounted wall hanger designed to display your instrument safely and securely. Its open-mouth design allows for quick access to your instrument so you can hang it or take it down in one easy move. Fender's chief concern is your instrument's safety so they engineered the Static Halo with a tilted design and padded rubber contact surface. The tilted design uses the simplicity of gravity to secure your instrument. The padded rubber grips don't subject the neck to scratches or any wear and tear that often happens with stands or other hangers. It has four mounting holes so mounting is super easy.